This course will provide a fundamental understanding of the physics of turbulent flows. The focus is on dynamics of turbulent flows in general, although some emphasis on effects of buoyancy and some applications to the atmospheric boundary layer will be discussed. The subjects to be addressed include: Reynolds averaging and closure problem; buoyancy effects; TKE and vorticity dynamics; scaling and self-preservation; isotropic turbulence; turbulent boundary layers; spectral dynamics; energy cascade and phenomenological theories; intermittent; numerical simulations of turbulence; 2D turbulence. The formal pre-requisite for this course is METEO520 - Geophysical Fluid Dynamics (or other graduate level course on fluid dynamics). Needless to say, you need a good understanding of tensor calculus and index notation, kinematics of fluid motion, and conservation equations. If you are not fluent in index notation, I strongly recommend you start practicing today! I strongly recommend that you choose ONE OR TWO of the books above to purchase. I will briefly discuss the strengths of each book in the first class and you are welcome to stop by my office to flip through the pages of all four texts to choose which ones fit your style/interests best. Final grade will be based on homework sets (40% of grade) and a final project (60% of grade). I will assign homework sets about every other week. Because homework contributes significantly to the final grade, I would like you to work alone as much as possible on the problems. I will not accept late homework without a proper justification (the dog ate my homework is not a proper justification). The final project will consist of a 20 to 25 minute talk at the end of the semester on a subject to be agreed upon between student and instructor by Tuesday Sept. 30th . Presentation will take place on a date agreed upon by instructor and students (likely on Thursday December 4th ). Literature review - choose one topic not covered in class and present an in-depth literature review. Here there are many interesting themes. I am listing a few suggestions separated in categories: physics of turbulence (non-local interactions, Lagrangian dynamics, coherent structures, non-Gaussian statistics, turbulent mixing, entrainment), turbulence theory and modeling (PDF models, EDQNM models, Langevin models, renormalization theories), atmospheric applications (atmospheric dispersion, turbulence in plant canopies, turbulence in urban areas, stratified fluids, multiphase flows such as clouds). Try searching for ideas in the following journals: Annual Reviews of Fluid Mechanics, Journal of Fluid Mechanics, Physics of Fluids, etc. Apply existing techniques to new data sets - choose one or two papers presenting some interesting data analysis technique and apply it to a different data set. I can provide you with data sets (atmospheric measurements, DNS of homogeneous isotropic turbulence, LES of atmospheric boundary layer) or point you to many freely available data sets on the web (wind tunnel data, pipe ow, channel ow DNS, etc). There are lots of interesting tools to study intermittency, fractal dimensions, etc. A good source of inspiration: papers on turbulence published in Physical Review Letters. In your presentation, you have to present the technique, the results from reference papers, and your own results, discussing similarities and differences. Explore simple toy models - choose one or two papers using simple models to study turbulence and reproduce their results (i.e., code up the model and run it on your own). In addition, try to explore further the results by incorporating an additional effect, exploring different regions of the parameter space, etc. In your presentation, you have to explain the model and the physics it is trying to capture, show the original results and your own analysis. Here are some ideas: shell models of turbulence, Burgers equation turbulence (Burgulence), Lagrangian stochastic dispersion models, simple non-linear dynamical system models (Lorenz for free convection, or similar models for stable boundary layers, etc.). Biography - choose one of the "big names" in turbulence and study his/her contributions to the field. You have to find out his main contributions, read his main papers, and present his work from a historical and scientific perspective (include information about his life, the state of science at the time and how he contributed to advancing the field). Some ideas: Reynolds, Taylor, Kolmogorov, Richardson, von Karman, Onsager, Batchelor, Kraichnan, Obukhov. You need to email me the theme for your final project and the main references (one or two papers) you are planning on using by Tuesday, September 30th . We subscribe to the College's academic integrity police. Even if you decide to discuss the homework problems with your colleagues, the work you then hand in under your name is to be summarized and written down by you. See http://www.ems.psu.edu/students/integrity/index.html . Penn State welcomes students with disabilities into the University's educational programs. Every Penn State campus has an office for students with disabilities. 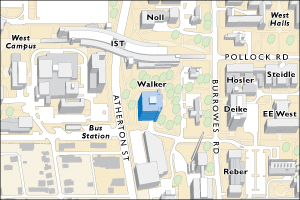 The Office for Disability Services (ODS) Web site provides contact information for every Penn State campus: http://equity.psu.edu/ods/dcl . For further information, please visit the Office for Disability Services Web site: http://equity.psu.edu/ods . In order to receive consideration for reasonable accommodations, you must contact the appropriate disability services office at the campus where you are officially enrolled, participate in an intake interview, and provide documentation: http://equity.psu.edu/ods/guidelines . If the documentation supports your request for reasonable accommodations, your campus's disability services office will provide you with an accommodation letter. Please share this letter with your instructors and discuss the accommodations with them as early in your courses as possible. You must follow this process for every semester that you request accommodations.